Vitamin B complex Nat the formula contains a high content of vitamin B. B vitamins are essential for the normal functioning of the nervous system. The active ingredients in the formula have been clinically proven. 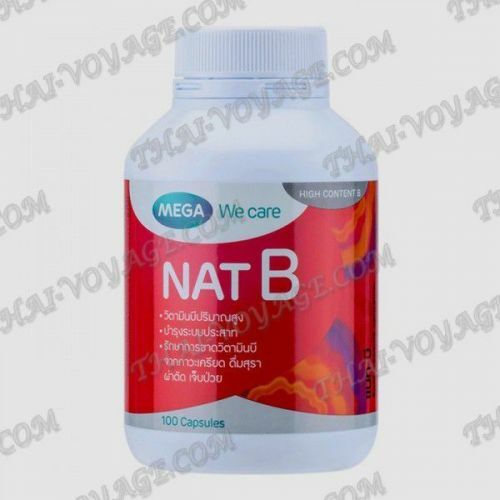 Nat the B Capsules are for the treatment of deficiency of vitamin B and support healthy function of the body, reduce stress and mood changes associated with a stressful job. B group vitamins play an essential role in metabolism. They can be useful during the additional requirements, such as emotional stress, alcoholism, surgery and various illnesses. Application: 1 capsule per day during meals. Composition of the product Vitamin B1 (Thiamine Mononitrate): 50 mg; Vitamin B2 (Riboflavin): 50 mg; Vitamin B3 (Nicotinamide): 50 mg; Calcium Pantothenate: 50 mg; Vitamin B6 (Pyridoxine Hydrochloride): 50 mg; Vitamin B12: 50 mcg; Folic Aci: 100 mcg; Choline Bitartrate: 50 mg; Biotin: 50 mcg; Inositol: 50 mg.